Garron played at Western Illinois and followed his college coach, Lou Saban, to the Patriots of the new AFL in 1960. He appeared in only four games as a rookie and, suffering from tonsillitis, was cut. Garron returned in ’61 with added weight and split time at fullback with Billy Lott, rushing for 389 yards. His 5.6 yards-per-attempt included a team-record 85-yard run and he also caught 24 passes for 341 yards (14.2 avg. ), averaged 27.4 yards on 16 kickoff returns, and scored a total of six touchdowns. Garron was a second-team All-AFL choice by the league and was selected for the AFL All-Star Game. 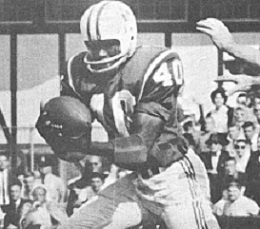 Slowed by injuries in 1962, Garron still gained 1314 all-purpose yards, averaging 5.9 yards while rushing for 392 yards and 28.6 yards on 24 kickoff returns that included a TD. Patriots went 7-6-1 to tie for first in the AFL Eastern Division. Won Divisional playoff over Buffalo Bills (26-8). Lost AFL Championship to San Diego Chargers (51-10). Garron was an AFL All-Star again in 1964, although showing signs of wear. He rushed for 585 yards but averaged only 3.2 yards on a career-high 183 carries with two TDs; he also caught 40 passes for another 350 yards and seven touchdowns. Garron was shifted to halfback and became more productive as a pass receiver, especially with FB Jim Nance emerging as the primary runner. He played until 1968, a total of nine seasons (all with the Patriots), and rushed for 2981 yards on 759 carries (3.9 avg.) with 14 touchdowns and caught 185 passes for 2502 yards (13.5 avg.) and 26 TDs. He averaged 25.8 yards on 89 kickoff returns that included two more touchdowns, giving him 42 TDs in all. Garron was selected to four AFL All-Star Games.